Introduced in 1914, the centre fork's primary use is as a knife-edge bearing. 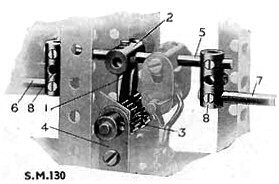 The reproduction of Standard Mechanism number 130 below shows a centre fork in this application. The early versions of this part were particularly sharp, making them very good at their job but rather dangerous! In the dark blue / dark yellow period, the centre fork was discontinued, and strangely substituted in the outfit 10 by a 1'' axle rod. This doesn't seem like much of a substitution to me! The document describing this is dated January 1979, so we can probably assume that centre forks weren't supplied in any outfits during 1979. There appear to be three easily identifiable versions of the centre fork. These are shown in the photo above. The first two are very flat and have sharp points, with a short shaft. The post-war version to the right has a substantially longer shaft, and the points are not particularly sharp – they still have reasonable thickness even at the points. This of course rather compromises their usefulness as knife edges. DMS/EMP shows the second version as dating from 1930, but it is certainly earlier than this. The author has the second version in a 1927 outfit, but the first in a 1925 outfit, which puts it somewhere in between those two, perhaps? Martin will be able to tell us this. Do you have a date for this? But also, the finish of the earliest parts is the dark grey of the axles. Post-war the centre fork was nickel plated, changing to zinc plating at some point after the light red/green period. Logically we could guess that this was probably around 1966, when much of the nickel-plating changed to zinc. The box to the right shows centre forks probably dating from the early 50's (mid yellow box with yellow label). Note that the picture clearly shows the pre-war wider version of the forks, but the contents are probably the later longer version in nickel plate. I have a number of the third, post WW2, version, but none are nickel or zinc plated. All are plain grey steel. Conversely, all examples of the two earlier versions in my collection are nickel plated. Is it my collection that is perverse or just the owner? I'm flattered by your faith in me here Charles, but remember that my 10 set was built up piecemeal. 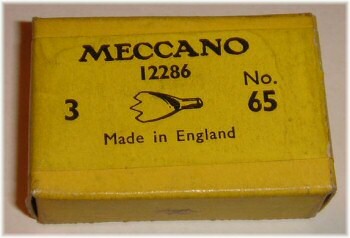 The provenance of some of the parts is therefore not always accurate. I have not yet pinned down (and probably never will) the nickel to zinc changeover, but believe it to be a gradual process right through 1966 and beyond, depending on the part. For a low volume item like the centre fork the date could well be very much later. Thanks for the tip chaps! Will avoid. Simon..."